Wladziu Liberace, or “Mr. Showmanship,” once said, “don’t be misled by this flamboyant exterior. Underneath I remain the same—a simple boy from Milwaukee.” He was born in West Allis in 1919 to a Polish-Italian family and, when he was four, began playing the piano. Liberace quickly outpaced his family’s basic piano lessons and began his seventeen-year scholarship with the Wisconsin College of Music when Florence Bettray-Kelly began instructing him in 1933. She would continue coaching him well after he became famous. 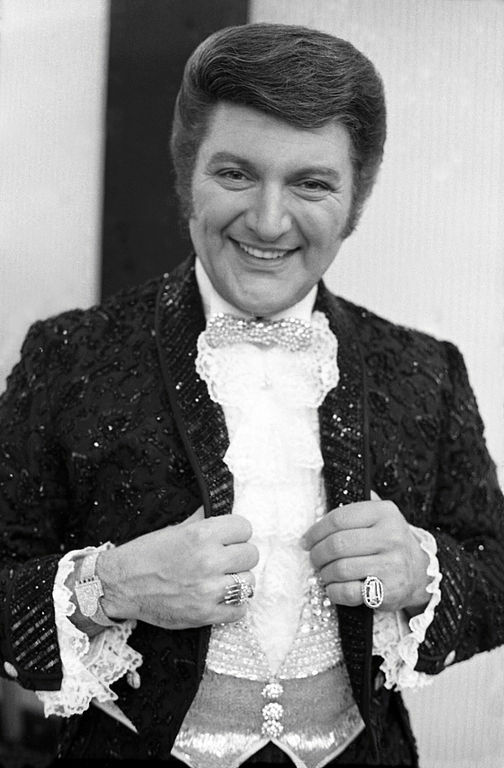 When Liberace was a teenager, he honed his ability to play the classics along with contemporary music. At West Milwaukee High School, which now houses the West Milwaukee Intermediate School, Liberace played “boogie-woogie, ragtime, and the latest popular songs” during lunch; he also played music for birthday parties and in honky tonk halls. In 1939, Liberace made his classical debut as a soloist with the Chicago Symphony Orchestra in a concert held at the Pabst Theater. That year, in La Crosse, Wisconsin, he developed what would eventually become his signature music style, a blend of modern and classical music, when he played Three Little Fishes, a song by Kay Kyser and his Band, as interpreted by Mozart and Chopin. It was then, Liberace stated, that he realized his audience understood “you could have fun at a concert without sacrificing the greatness of music.” Liberace, believing Milwaukee was too small for his ambition, left in 1941. He eventually settled in California, where he was mentored by Clarence Goodwin and “realized he was on the road to riches, rhinestones and Rolls-Royces.” For more than twenty years, Liberace had an annual income of $5 million a year from concerts, movies, and television appearances. He died in 1987, at age 67, of complications from AIDS. Liberace’s presence in Milwaukee continues as his old high school renamed the school auditorium after him in 2014. ^ Darden Asbury Pyron, Liberace: An American Boy (Chicago: University of Chicago Press, 2001), 1-3. ^ William Povletich, “Liberace: The Milwaukee Maestro,” Wisconsin Magazine of History 92, no. 2 (2008-2009): 15-17. ^ Julie Lawrence, “Liberace Museum Showcases Legend’s Life from West Allis to Las Vegas,” OnMilwaukee.com, March 15, 2007, last accessed May 25, 2017. James Barron, “Liberace, Flamboyant Pianist, Is Dead,” The New York Times, February 5, 1987, last accessed May 25, 2017. ^ Jane Ford-Stewart, “Liberace Still Glitters in West Milwaukee Lore: His Old High School Names Auditorium after Famed Village’s Famous Star,” WestAllis Now, October 30, 2014, last accessed May 25, 2017. Liberace, Wladziu. Liberace: An Autobiography. New York: Putnam, 1973. Liberace, Wladziu. The Wonderful World of Liberace. Nashville, TN: Turner, 2003. Pyron, Darden Asbury. Liberace: An American Boy. Chicago: University of Chicago Press, 2001.